The God of War reboot for the PlayStation 4 has been one of the platform’s most anticipated titles ever since it was announced last year at E3, as it will be the first game in the series to be developed for the PS4. And it looks like fans might not have to wait too long to finally get their hands on the franchise’s eighth installment, as the new voice actor for Kratos might have unintentionally revealed the game’s possible release date. 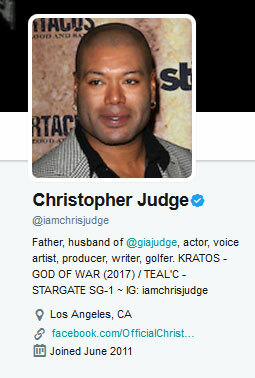 Christopher Judge, who played Teal’c in Stargate SG-1 and was announced as the new voice of Kratos last year, recently updated his Twitter account profile to say that God of War would be a 2017 title, inadvertently giving away the game’s release date. Whether this was done unintentionally and/or by mistake is unknown, but if it is true and the God of War reboot truly is coming out this year, we’ll probably have an official announcement during E3 2017 and a possible release date of sometime in the Fall.